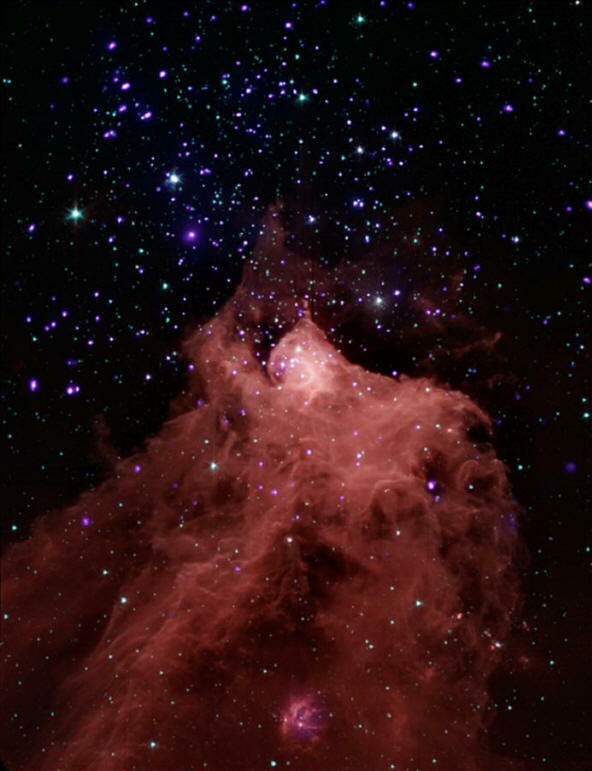 Chandra and Spitzer composite X-ray/infrared image of the Cepheus B nebula. It is commonly assumed that stars are gravitationally compressed hot gas. What are the stars? The question might seem self-evident, since we are taught from an early age that they are intensely bright, burning balls of hydrogen gas. A star's great size, therefore its great gravitational attraction, is what holds the planets in their orbits. Its core of fusion fire sends energy on a million-year journey before the radiation is emitted from its surface, so dense is its interior. How are stars formed and by what agency are they ignited? The answer, according to accepted astrophysical theories, is gravity. At some time, billions of years before any particular shining star was born, it started out as a wispy cloud a thousand times less dense than the most rarified mist. One of the questions that astronomers have been asking for many years about the process is what caused such insubstantial clouds to condense? Star formation is initiated according to two main theories. First, the gaseous cloud might cool down from whatever high temperature it once possessed (although what event heated the cloud is not elucidated), thermal energy falls off, allowing gravity to assert itself on the individual particles and the cloud falls in on itself. Second, the explosion of a supernova (or intense bursts of radiation from a nearby star) might generate shock waves that pass through the proto-stellar cloud, forcing the particles to collide and clump together. Gravity then takes up its familiar position, eventually pulling the cloud into a structure dense enough for fusion to take place. According to a recent press release from the Marshall Space Flight Center and the Chandra X-ray Observatory, there is reason to believe that radiation from neighboring massive stars could be the most common method for pushing the nebular clouds into collapse. The Cepheus B nebula is approximately 2400 light-years from Earth, and is composed primarily of hydrogen gas. As astronomers reckon age, there is supposed to be a large population of young stars bordering a region where a massive star's radiation impinges on the cloud. Infrared data from the Spitzer Space Telescope appears to show "protoplanetary disks" around many of the stars, indicating (according to theory) that they are young, since older stars would have already absorbed the dust and gas. Older stars would not exhibit the specific infrared frequencies that are supposed to indicate disks. In this paper we will not take up stellar ages and the conventional viewpoints that determine them. Suffice to say here is that stellar diagrams that attempt to establish age according to color and temperature are missing important points. If other electrical factors are added, temperature and brightness become a matter of externally applied electric currents and not internally generated fusion energy. The differences in the two concepts are not trivial, especially when they are used to explain other observations. It is an entirely new paradigm. Regardless of whether it is shock waves or "radiation pressure," the energy that drives the effects in conventional theories is kinetic and mechanically induced. In fact, lowering the thermal activity is how the first theory suggests stellar formation begins. The second theory requires a star 20 times more massive than the Sun to irradiate the cloud from close up for millions of years. In the Electric Universe, gravity, density, compression, and mechanical phenomena give way to the effects of plasma. The stars are not hot, dense balls of hydrogen being crushed into helium and electromagnetic radiation by gravitational pressure. Rather, they are isodense balls of plasma—a form of slow-motion lightning—with all the fusion taking place on the surface. Since they are the same density throughout, with no superdense fusion cores, their mass estimates are most likely being seriously overstated by papers written from the consensus. The Electric Universe definition of "plasma" is not the conventional one of "ionized gas." It is that confused apprehension of plasma that falls back on ideas about gas behavior and thermal ionization. "Plasma," as theorist Mel Acheson wrote, "is an emergent (i.e., higher-level or statistical-level) orderliness of complex electrical forces: such properties as filamentation, long-range attraction and short-range repulsion, braiding, characteristic velocities, formation and decay of plasmoids, and identity of properties at different scales." Electric stars aren't begotten in nebular clouds, their progenitor is charge separation. Everything we see in the Universe—99.99% to be more precise—is ionized to some degree, therefore it is plasma. Positive ions and negative electrons move within plasma in ways not governed by gravity, although gravity might cause some heavy positive ions to create a charge surplus in one volume of space over another. When that happens, a weak electric field develops. An electric field, no matter how weak, will initiate an electric current that generates a magnetic field. Those fields interact with the magnetic fields generated by other currents. In images from space, as well as in high-speed photographs of plasma activity in the laboratory, those currents are seen to form twisted pairs of filaments, called Birkeland currents. Birkeland currents follow magnetic field lines and draw charged material from their surroundings with a force 39 orders of magnitude greater than gravity. Magnetic fields pinch the ultra-fine dust and plasma into heated blobs of matter called plasmoids. As the effect, called a "z-pinch," increases, the electric field intensifies, further increasing the z-pinch. The compressed blobs form spinning electrical discharges. At first they glow as dim red dwarfs, then blazing yellow stars, and finally they might become brilliant ultraviolet arcs, driven by the electric currents that generated them.